*I removed the chicken breasts and used them for a stir-fry. Fill pot with water until the chicken is just covered. Turn down to a very low simmer. Cook for at least two hours (longer is better). Remove from the broth all the ingredients in 1. 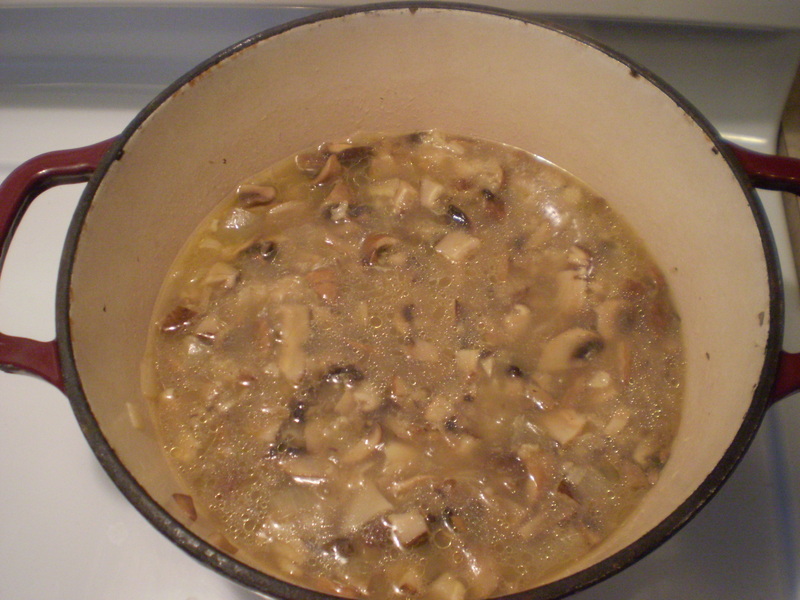 Remove the chicken meat from the bones and place back into broth. Add noodles, soy sauce, freshly squeezed lime juice, and fish sauce to broth. Bring broth to a boil. Taste. Season with salt and pepper to your preference. Serve. Garnish with green onions. Suggestion: if you want to reduce the fat content in the soup, at Step 7, let the broth cool, place in the fridge to let the fat solidfy and then skim off the fat solids that have formed on the top surface of the soup. Then continue onto Step 8. 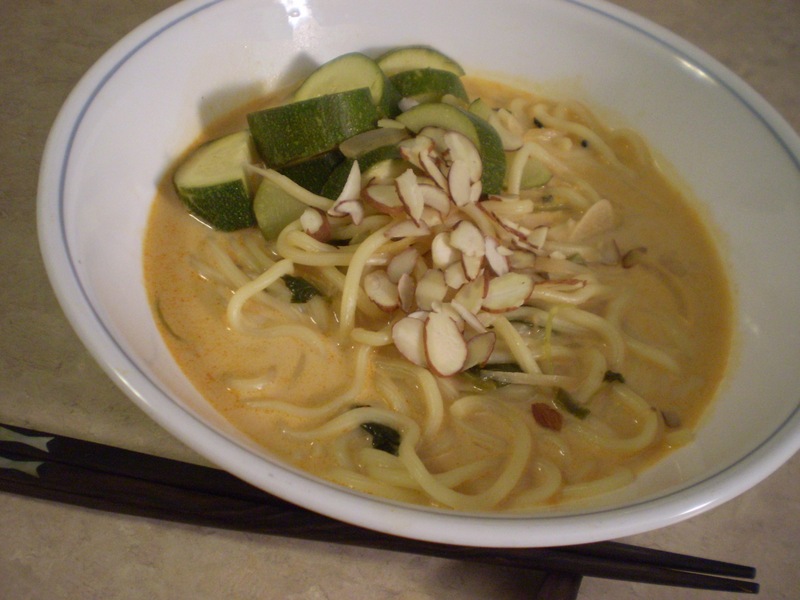 Coconut Thai (red) curry soup with noodles and zucchini. The following recipe serves two. your choice of noodles, enough for two people (e.g. thin rice noodles, vermicelli, yakisoba noodles, udon noodles, etc.) TIP: soak the noodles in boiling hot water to remove any starches and oil. Soaking time depends on the style of noodle. 1. Heat a large deep pot on high. Once hot, add in oil, onions, garlic and lime zest. 2. Cook until garlic is brown, then add in coconut milk, thai curry paste and brown sugar. Combine well. 3. Add in broth and an equal amount of water and the cilantro and soy sauce. Bring to a gently boil. Simmer for approximately 20 minutes. 4. Remove the cilantro bundle. 5. Add in noodles and zuchinni. 6. Once noodles and zuchinni are soft, turn off heat and add in lime juice and green onions. 7. 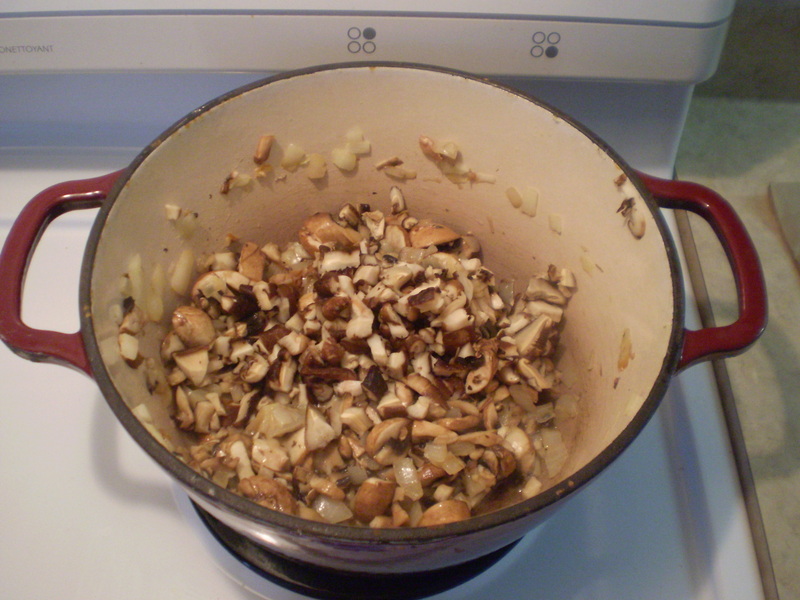 Dish out into two large bowls and if so desired, garnish with (toasted) sliced almonds. There is a lot of variation in this recipe. Here are some suggestions: add 1 to 3 tbsps of fish sauce; sautee in some tofu, pieces of chicken or whole shrimp; simmer the soup broth additionally with lemon grass and ginger; add a splash of sesame oil at the end. 1. Heat a large deep pot on high. 2. Add in oil and onions. When the onions are soft, add in the tomatoes. 3. Cook until the tomatoes are soft and begins to release its juices. 4. Add in the carrots, green peppers, garlic and seasoning (paprika, bay leaf, salt and pepper). Mix well. 5. 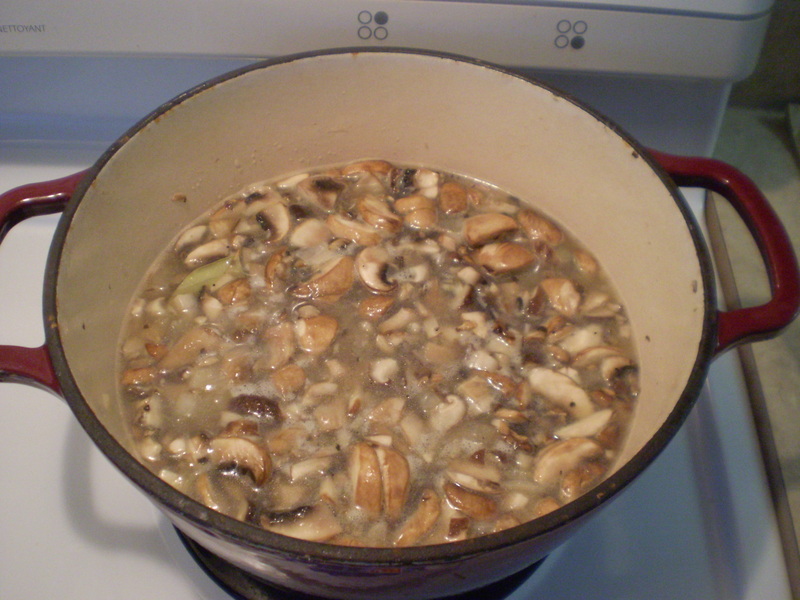 Add enough broth to cover all the vegetables, then add in an equal amount of water as broth. 6. Once the liquids come to a boil, turn down heat to a gentle simmer. 7. 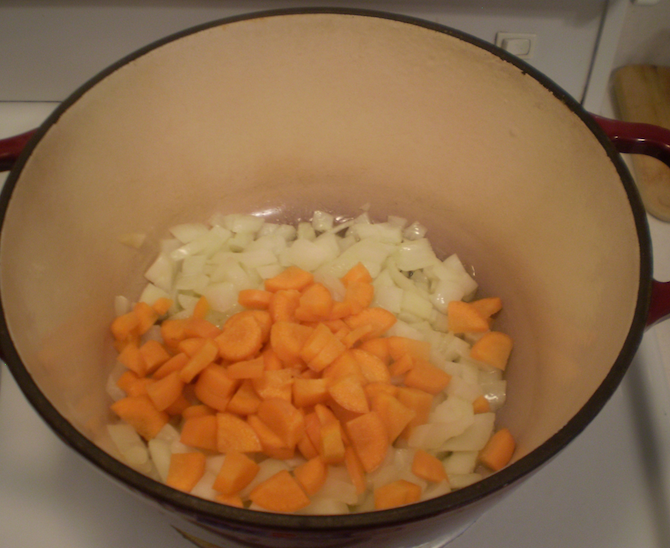 Cook for about 15 to 20 minutes or until the carrots are soft. 8. Then add in the noodles and cook until noodles are soft. 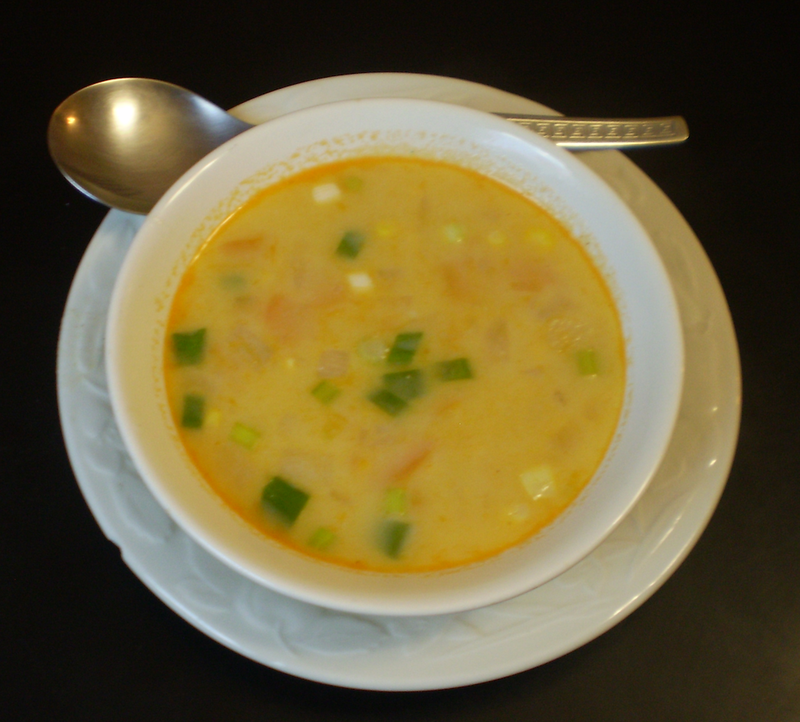 The soup is now ready to be served. 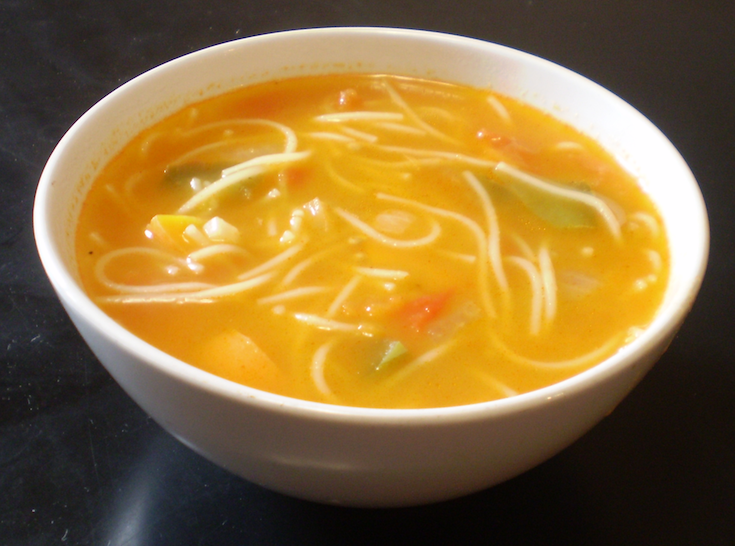 *Since noodles and potatoes are starchy, by adding them to the soup, it will thicken the soup and you may wish to add a little more broth or water. 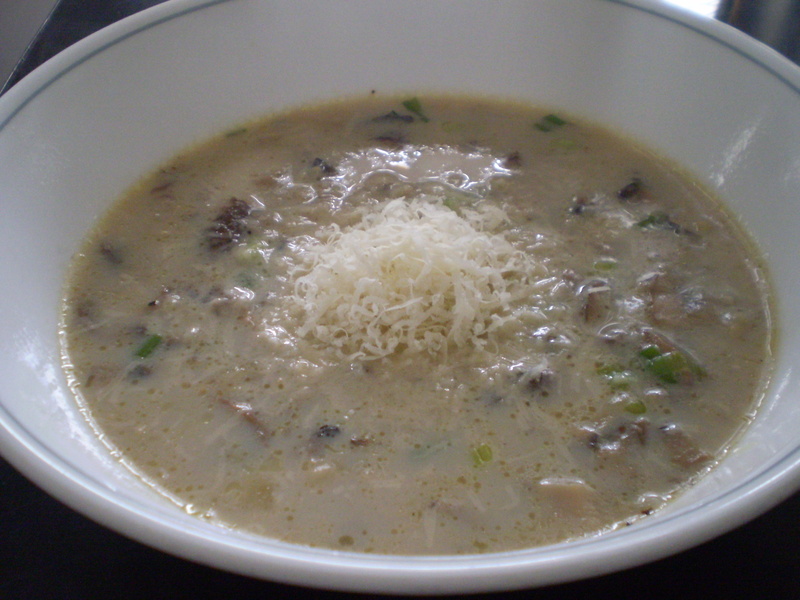 The following soup recipe makes 4 to 6 servings. 1. Heat on high a large deep pot. 2. To the pot, add in oil, butter, onions and carrot. Cook on medium heat until onions are soft (about 5 minutes). 3. 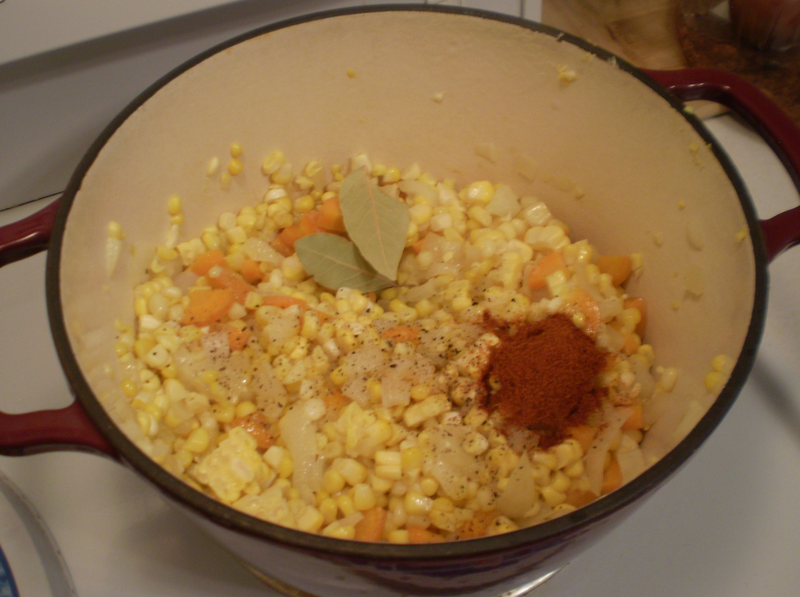 Add in corn kernels, garlic, salt, pepper, paprika and bay leaf. Thoroughly mix and turn the heat back to high. Spices added to the vegetables. 4. Add enough chicken broth such that all the vegetables are cover. 5. Add in an equal amount of water and the corn cores. 7. Turn down to a simmer and add in the potatoes. 8. Cook covered until potatoes and carrots are soft (about 20 to 25 minutes). 9. Remove the corn cores. 10. Remove the pot from the burner. Using a potato masher, roughly mash the soup. 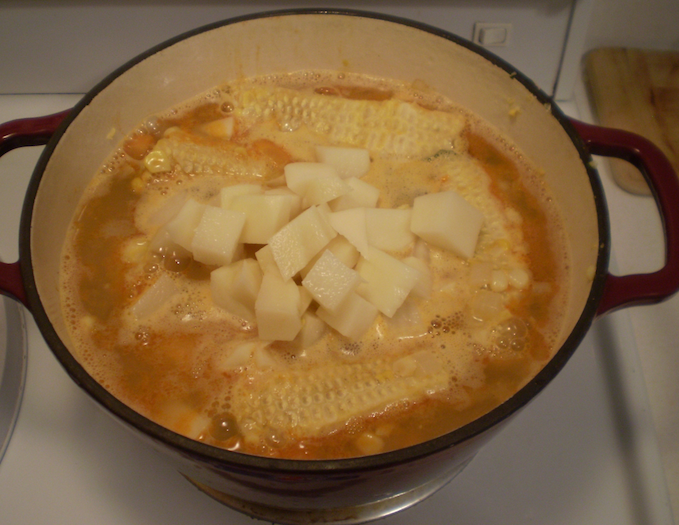 This will give the soup a thicker, creamier consistency. 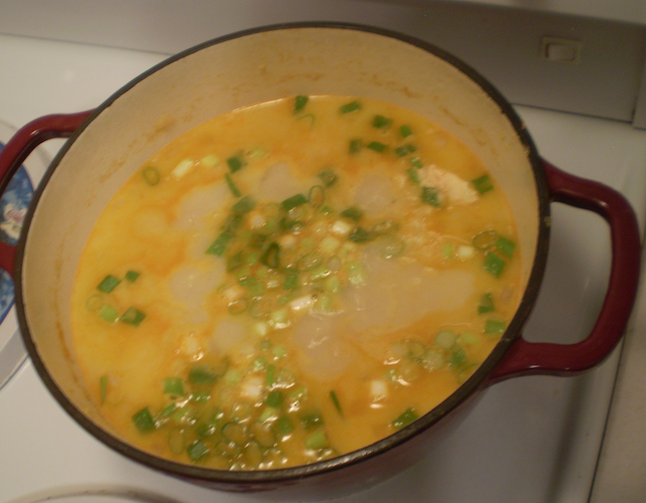 After adding in the milk and green onions, return to burner. 11. 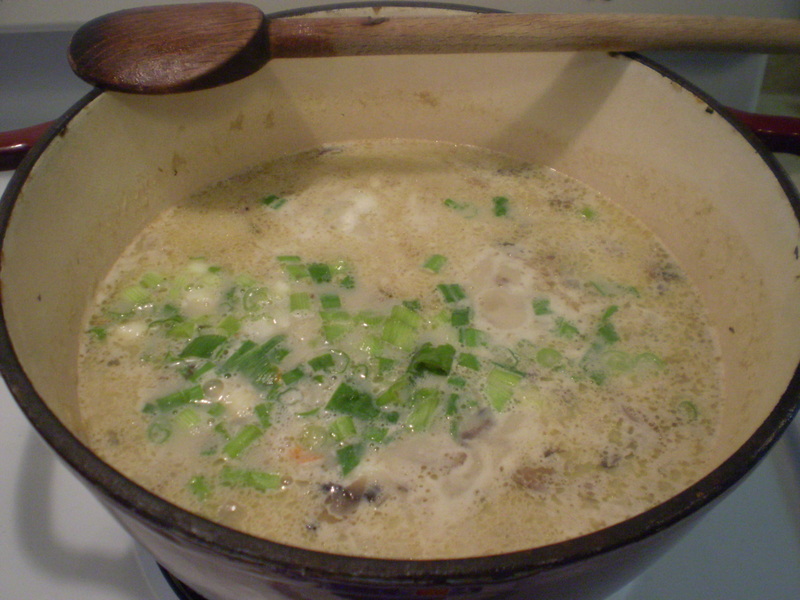 Add in the milk and green onions. Return to the burner. 12. Once the soup is hot again, serve immediately. 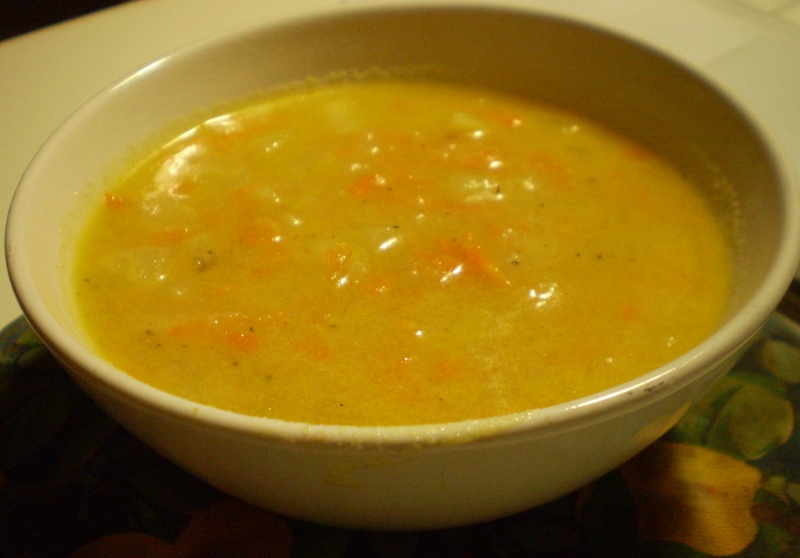 *make the soup vegetarian friendly by substituting the chicken broth with vegetable stock or water. 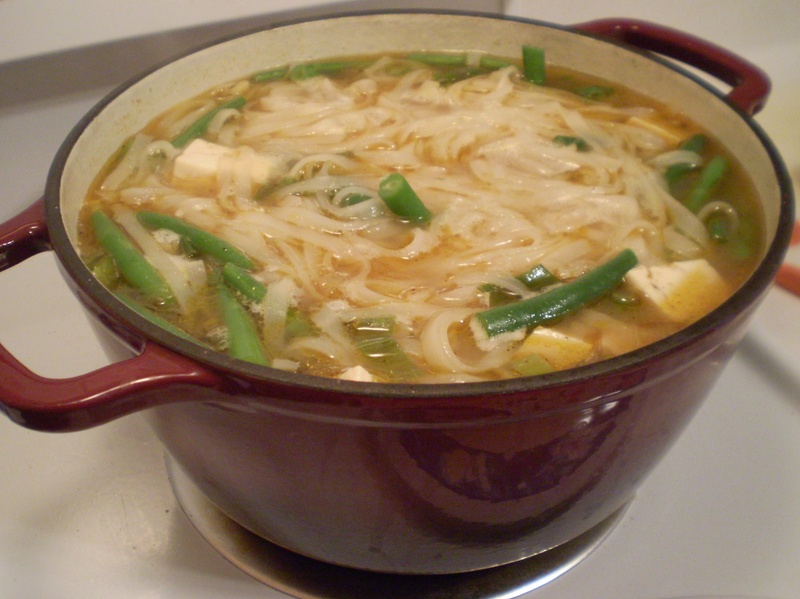 Noodle soup with green beans, tofu and spices. Green beans, tofu, lime and sesame oil. In a large pot, on medium high heat add in the olive oil, garlic, ginger, lime zest and onions. Cook until the onions have wilted. Add in the sugar, salt, paprika and black pepper. Combine well, then add in the broth as well as an equal amount of water and a few generous swigs of soy sauce. Depending on the amount of noodles, feel free to add in more (or less) broth, water and soy. Turn up the heat so the liquids boil as quickly as possible. 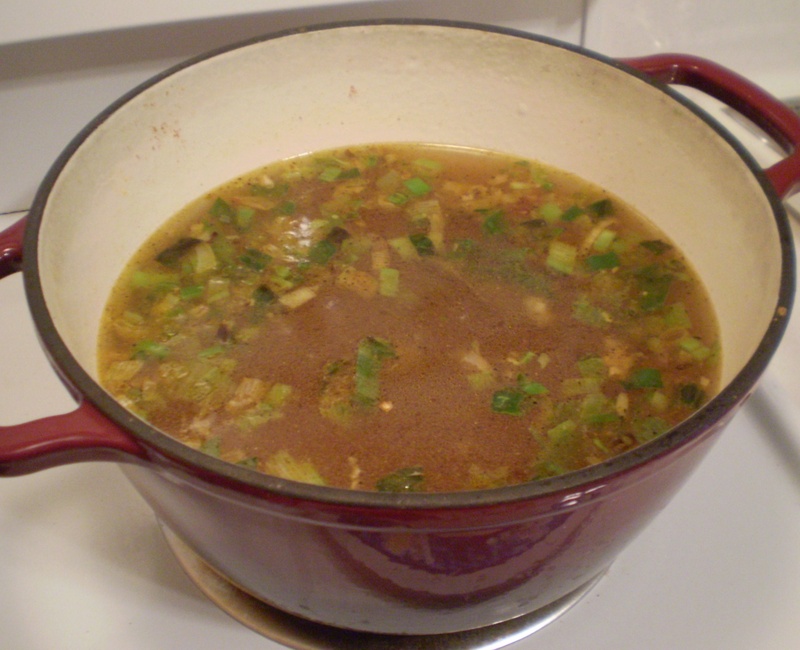 Soup broth with spring onions, garlic, ginger, lime zest, soy sauce and spices. Once the liquids are boiling, add in the tofu. 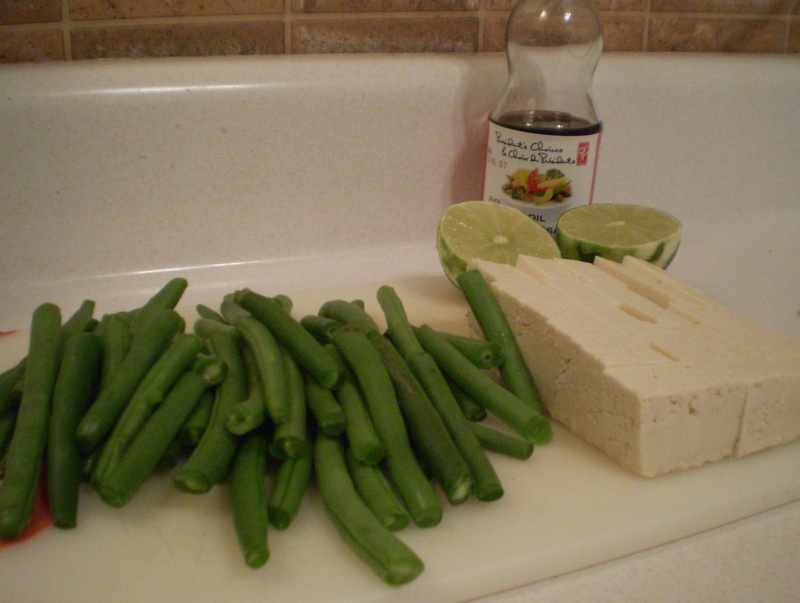 Once the tofu has been heated through add in the green beans. Drain the noodles thoroughly and add in the noodles. Once the noodles are soft, add the lime juice and a light drizzle of sesame oil. 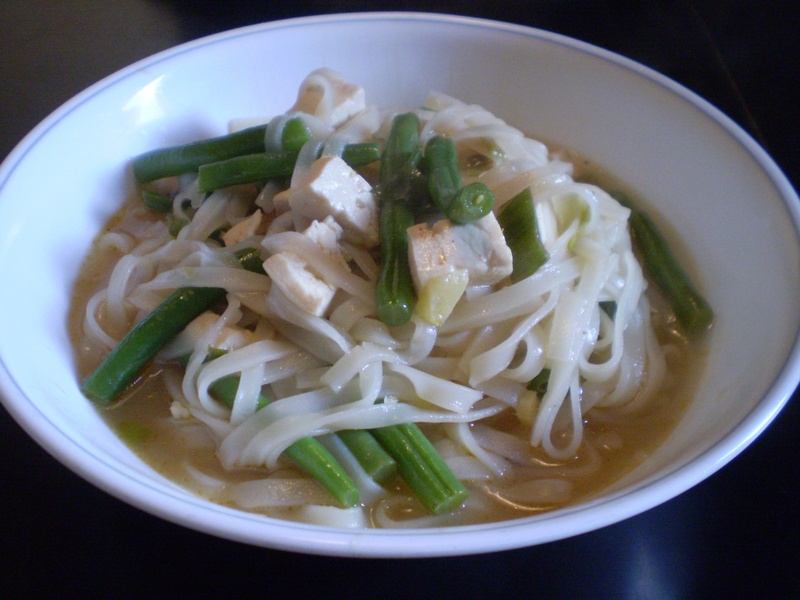 Asian inspired broth with rice noodles, tofu and green beans. If so desired, garnish each noodle soup bowl with a sunny-side-up egg. Serve immediately.